Among them is Northern Ontario’s Bella Croisier of the Idylwylde Golf & Country Club in Sudbury. Her team capped off the round robin with two wins on Friday at the Glen Allan Recreation Complex and Sherwood Park Curling Club. “It’s been a great week so far. We’re really happy with the facilities and the volunteers are amazing,” Croisier said. Croisier, vice-skip Jamie Smith, second (and sister) Piper Croisier, lead Lauren Rajala and coach Shawn Croisier (her father) picked up wins against Ontario’s Emily Deschenes (Manotick Curling Club) and Yukon’s Katarina Anderson (Whitehorse Curling Club) and completed the round robin with a 5-1 record for first overall. It’s the second consecutive year the team has advanced to this stage of the national championship, but Croisier wants to improve on last year’s result. Last season the team lost their first two games in the double-knockout bracket and missed the playoffs. She knows she’ll need to maintain her intensity for the remainder of the event. “Playing with our back’s against the wall, taking it one game at a time. We need to make sure we get through that,” Croisier said. 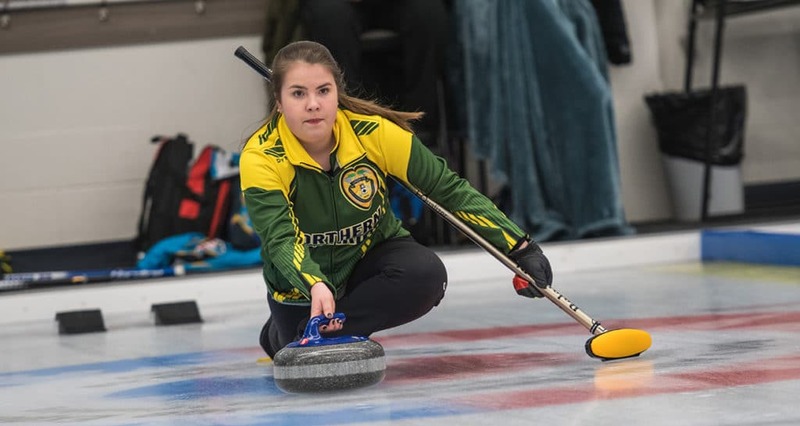 The 17-year-old Grade 12 student has learned a lot in her 11 years of curling, but some of her most valuable experience has come this season. Her team represented Ontario at the Canada Winter Games this year in Red Deer, Alta., and won the gold medal. “We learned so much, even playing in the finals. Just being in that position means we have that experience coming into this,” she said. Also qualifying out of Northern Ontario’s pool were Saskatchewan’s Emily Haupstein (Weyburn Curling Club) in second at 4-2, Alberta Host Team’s Julia Bakos (Crestwood Curling Club, Edmonton) at 4-2 and Ontario’s Emily Deschenes (Manotick Curling Club) at 3-3. In the opposite pool, Alberta’s Jessica Wytrychowski (Airdrie Curling Club) topped the competition with a 5-1 record. Manitoba’s Emma Jensen (Dauphin Curling Club) was second at 4-2. New Brunswick’s Melodie Forsythe (Curl Moncton) and British Columbia’s Kaila Buchy (Kimberley Curling Club) each had 3-3 records and qualified in the third and fourth spots respectively. On the men’s side British Columbia’s Erik Colwell (Vernon, Kamloops and Invermere Curling Clubs) claimed the top spot in Pool A with a 5-1 record. Manitoba’s Jordon McDonald (St. Vital Curling Club, Winnipeg) also finished 5-1 and received second place due to their head-to-head record. Ontario’s Dylan Niepage (Coldwater & District Curling Club) was third with a 4-2 record, while Nova Scotia 2’s Ethan Young (Mayflower Curling Club, Halifax) claimed the final spot in the pool with a 3-3 record. In Pool B, Alberta’s Nathan Molberg (St. Albert Curling Club) retained his spot atop the pool with a 5-1 record. New Brunswick’s Josh Nowlan (Curl Moncton) was second at 4-2, while Nova Scotia’s Adam McEachren (Truro Curling Club) was third with his 4-2 record. Saskatchewan’s Jayden Bindig (Wadena RE/MAX Curling Club) picked up the final double-knockout bracket spot with an even 3-3 record. The 2019 Canadian Under-18 Curling Championships continue on Saturday with games at 8:30 a.m., 2 p.m. and 7:30 p.m. (all times MT). Four teams will advance through the championship round into an Olympic-style playoff (1 vs. 4, 2 vs. 3) where the winners advance to the gold-medal games and losers will play for bronze.